Go for a jaunt from Santa Monica to Santa Clarita to see Six Flags Magic Mountain about 42 minutes away. The adventure continues: take a leisurely stroll along Santa Monica Pier, look for gifts at Bergamot Station, soothe aching muscles at some of the top local wellness centers, and immerse yourself in nature at Santa Monica Beach. To see photos, maps, traveler tips, and more tourist information, read our Santa Monica trip itinerary planner. Sydney, Australia to Santa Monica is an approximately 18.5-hour flight. You'll gain 18 hours traveling from Sydney to Santa Monica due to the time zone difference. Expect a bit cooler temperatures when traveling from Sydney in November; daily highs in Santa Monica reach 24°C and lows reach 14°C. Cap off your sightseeing on the 6th (Mon) early enough to go by car to Cambria. Cambria is a seaside village in San Luis Obispo County, California, United States midway between San Francisco and Los Angeles along California State Route 1 (Highway 1). Change things up with these side-trips from Cambria: Morro Rock (in Morro Bay) and Monarch Butterfly Grove (in Pismo Beach). The adventure continues: look for all kinds of wild species at Elephant Seal Rookery, kick back and relax at Moonstone Beach, cruise along Moonstone Beach Dr, and explore the historical opulence of Friends of Hearst Castle. To see photos, ratings, traveler tips, and tourist information, refer to the Cambria vacation trip planner. You can drive from Santa Monica to Cambria in 4.5 hours. Alternatively, you can do a combination of bus and flight; or do a combination of taxi and bus. Traveling from Santa Monica in November, expect nights in Cambria to be about the same, around 12°C, while days are little chillier, around 17°C. Finish up your sightseeing early on the 9th (Thu) so you can go by car to Santa Barbara. When in Santa Barbara, make a side trip to see Bart's Books in Ojai, approximately 52 minutes away. Dedicate the 9th (Thu) to wine at some of the top wineries in the area. 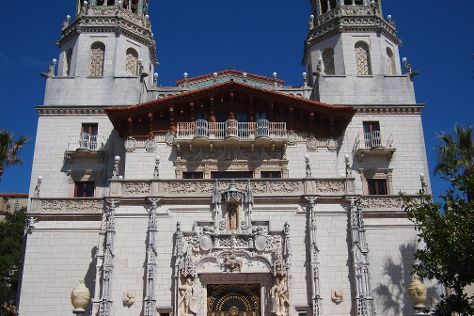 Next up on the itinerary: steep yourself in history at Old Mission Santa Barbara, enjoy breathtaking views from Santa Barbara County Courthouse, admire nature's wide array of creatures at Santa Barbara Zoo, and shop like a local with State Street. To find more things to do, where to stay, photos, and more tourist information, refer to the Santa Barbara travel planner. Drive from Cambria to Santa Barbara in 2.5 hours. Alternatively, you can do a combination of bus and train; or take a bus. While traveling from Cambria, expect somewhat warmer days and little chillier nights in Santa Barbara, ranging from highs of 24°C to lows of 8°C. Finish up your sightseeing early on the 11th (Sat) so you can travel back home.